CDPHPD works with partners and stakeholders to develop and implement coordinated state plans for chronic disease prevention and management. 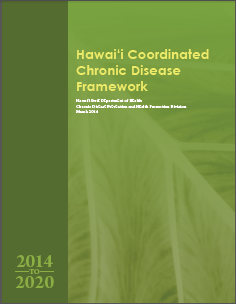 Individual state plans are created for chronic disease program areas and risk factors, and they are united under the overarching Hawai‘i Coordinated Chronic Disease Framework. As they are updated, the individual state plans will mirror one another by following a similar format and structure. Coordinated state planning improves collaboration between stakeholders, reduces duplication, and leverages resources to address common risk factors through evidence-based policies, programs, and services. Coordination is reiterated in national funding requirements, recommended strategies, and best practices which now combine multiple program areas to address the spectrum of chronic disease prevention and management. Focuses on synergy and coordination across programs, settings, and stakeholder groups. Approaches chronic disease by sector area—community, education, worksites, and health systems—to broaden the reach of current efforts. Is not an action plan and does not replace the individual program state plans. 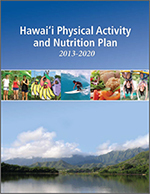 Provide detailed, specific, and targeted activities related to a specific program area. Each plan includes shared goals that are developed and adopted by stakeholders across the state.